Katherine Nicholas, Do Drop In Senior Activity Coordinator. 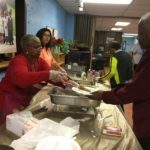 MNDC is known for its efforts with local youth, but it also runs a successful community program for senior citizens. Known as the Do Drop In, the program meets Monday, Thursday and Friday of each week from 10 a.m. – 3 p.m. at the Park House and provides a place for men and women to come together and socialize over a cup of coffee and lunch. Katherine Nicholas has been the coordinator for the past two years and is responsible for making the Park House a welcoming space, providing and cooking the food, planning trips and workshops and anything else she thinks may be of interest to this community. Members can choose to sit and talk, read a book on their own, take an exercise class, utilize the computers, even go on a group trip. Men gather in groups to play cards, checkers and dominos. And the women talk about their grandchildren, maybe take a crocheting class together or swap advice. Once a month, Ms. Nicholas plans an “Everybody’s Birthday” event to celebrate members’ birthdays for the month. On another day, Trader Joe’s drops in and gives out food — eggs, fresh fruit and vegetables, bread — whose sell date has just passed but is still perfectly fine to eat. And this summer and fall, Ms. Nicholas is planning some trips: to the Brownstone in Paterson for a nice lunch; Seaside Heights for a stroll on the boardwalk; and Washington D.C. to visit some museums. As the name implies, all seniors are welcome — not just from Montclair, but the surrounding towns, as well.